Welcome to the new Aqua Map Master! 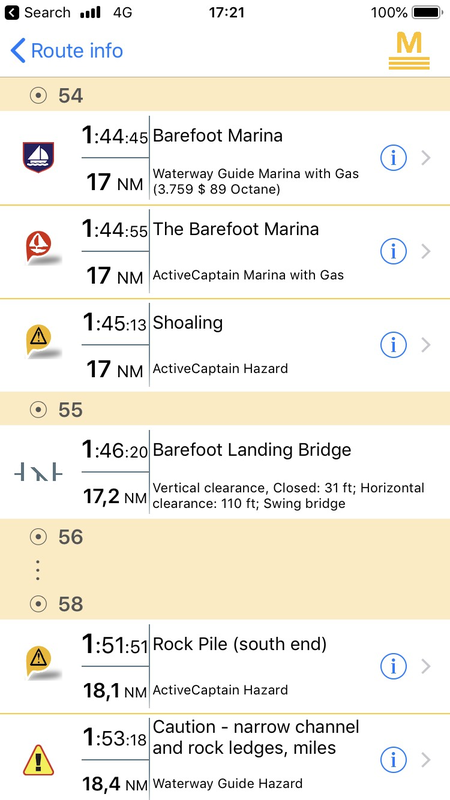 Aqua Map Master (iOS only at the moment) is the container for all the new and future advanced navigation features that will be implemented for the Aqua Map product. External devices integration through the NMEA and Signal-K, AIS, Route Explorer and the USACE Surveys service are the first group of Aqua Map Master features for the 2019 season. 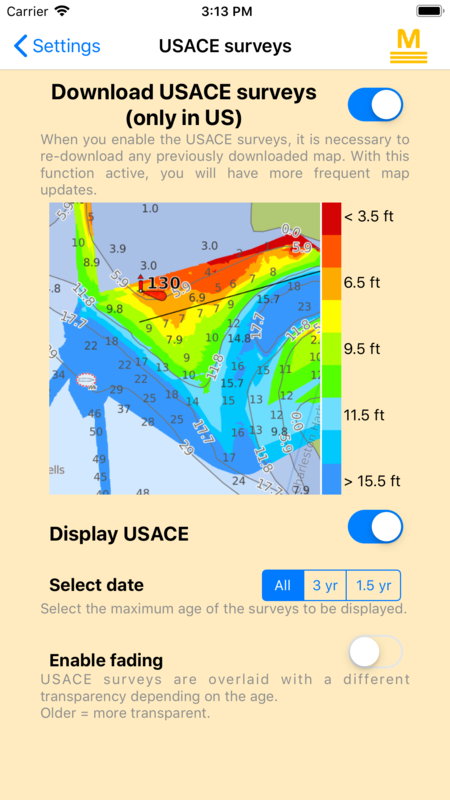 At the moment Aqua Map Master is for iOS users only, except for the USACE Surveys service that is available also for Android (the other features for Android will come as soon as possible). 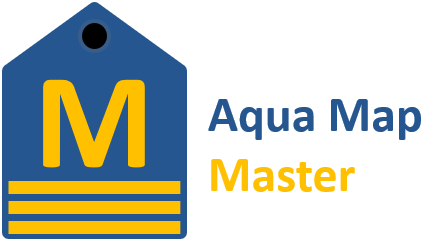 Add Aqua Map Master subscription (14 days free trial) on top of your existing Aqua Map charts product to begin the transformation of your smartphone into a full functional chartplotter. 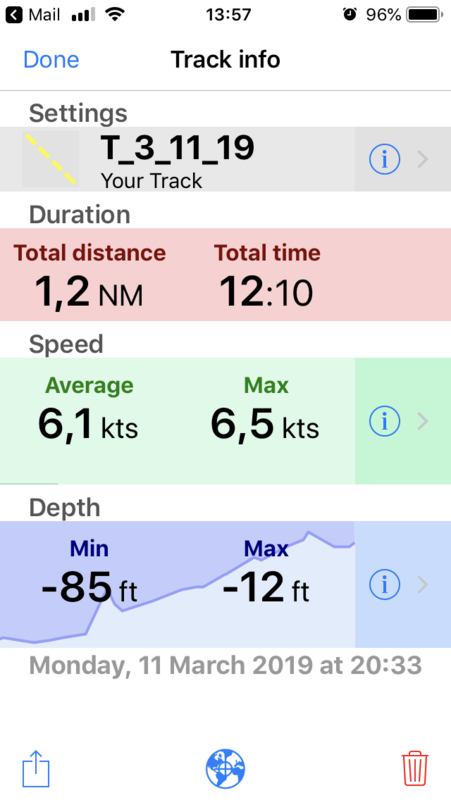 Connect your AIS device to Aqua Map and show on the map all the other boats nearby. For each boat you will be able to display its name, distance, direction and time to collision. Once your AIS device is connected (see WiFi Connection) all the received boat AIS signals will be overlaid on the map. The boat icon size is according to the AIS information received by each boat (larger icon larger boat). Each boat shows a course line the length of which can be preset (in time minutes, so depending on its speed the course line lenght will grow or srink) from the AIS setting page. On the map it will be displayed also an AIS box, on the left, showing in realtime the distance and time to collision with the nearest AIS boat target. This box turn to flashing red when the collision is imminent according to the setting you predefined in the AIS setting page. Pressing on this box a list of all the AIS targets will be displayed. You will be able to order them by CPA (Closest Point of Approach), by Distance or by Name. Tap on the "i" icon to get more info, when available, about that boat.Press the lower right red-triangle icon to make this boat your "main" target (you can have multiple "main" targets) it will be displayed in red on the map and in the list. From this page you can also set this boat as your friend, it will be stored in an internal database of friends and displayed in green when visible on the map and in the list. Tap on the description to make a goto to that boat on the map. Set the course line length. This require a time in minutes, so the length of this line will be modified in realtime depending on the relative AIS target speed. Minimum allowed CPA (Closest Point of Approach). It defines the safety distance with the other AIS targets. Time to CPA (Closest Point of Approach). It defines the number of minutes the system will alert before reaching the CPA. 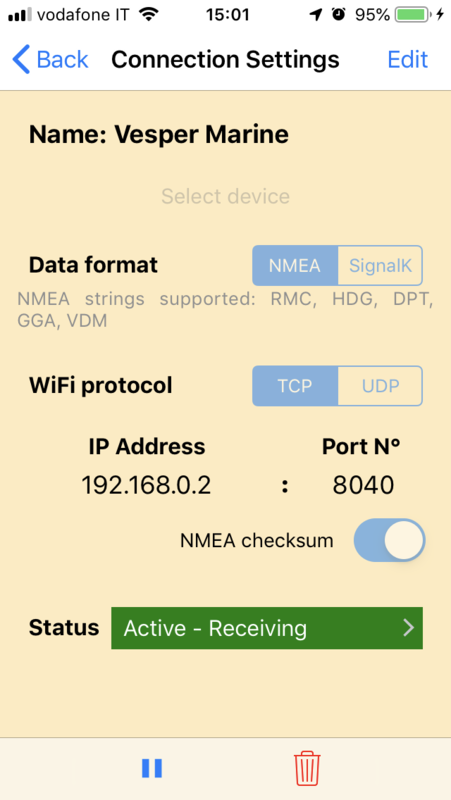 Connect via WiFi all your NMEA0183 and Signal-K devices to the Aqua Map application. AIS, depth sounder, wind sensor, external GPS, compass directly on your Aqua Map display. Through this setting page you will be able to connect your Aqua Map to any WiFi Gateway (see below list of tested units). 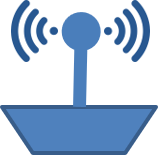 The WiFi Gateway is capable to connect to NMEA0183 devices and so distribute those signals via WiFi to the smartphone/tablet and so to Aqua Map. Pressing the upper right "+" button you will be able to add a new connection, then setup the proper IP address (if not automatically set by the application) and port.. Your device shall be connected to the same WiFi of your Gateway. 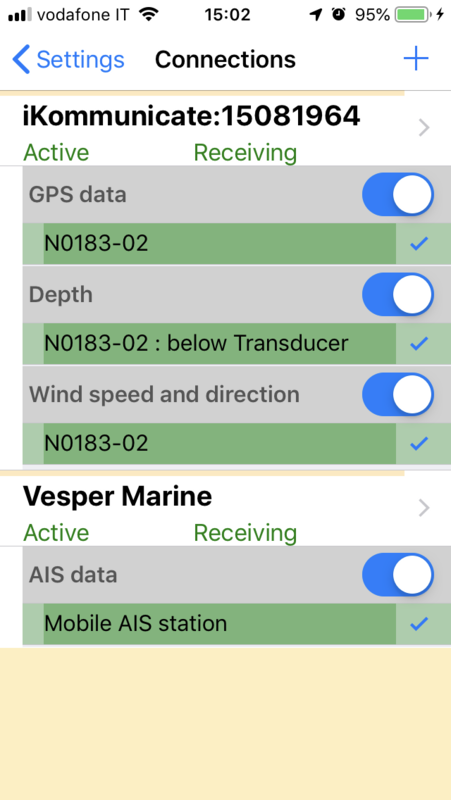 Once the connection is completed, a list of the available sensors will be displayed and you will be able to define which to use with your Aqua Map. 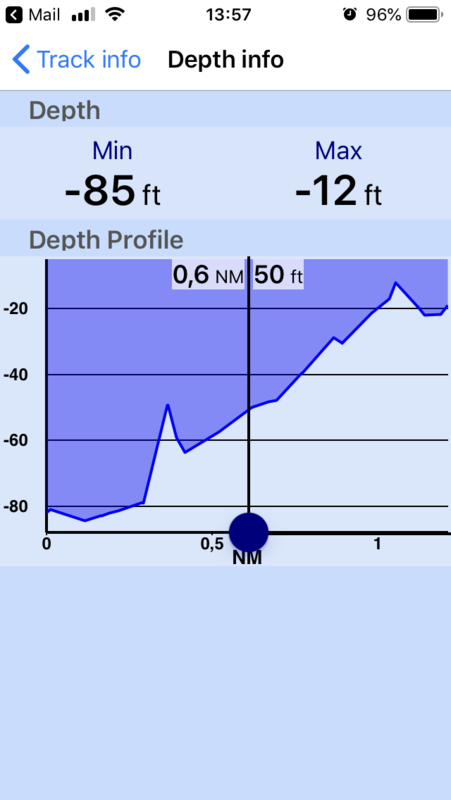 NOTE: in case of an echo sounder sensor available, then the GPS Track will record also the depth information. Find all hazards, alerts, locks, bridges and fuel stations along your route. Plan in advance where to stop for fueling, the best time for a bridge approach and highlight all the hazards along the route. All the Fuel stations (ActiveCaptain and WaterwayGuide), having the selected fuel type, along your route (highlighting the price when available). Accessing the Route details page you will see a summary of the Hazards/Alerts, Bridges/Locks and Fuel Stations found. Then you will be able to access a detailed list with relative distance, ETA (Estimated Time Arrival) and a brief description for each item (if the Route is not active, you are not playing it, then the distance is from the route starting point and the ETA is the time from the route starting point based on your setting speed). Tap the "i" icon to access the object details. Tap on the description to make a goto on the map to the selected object. 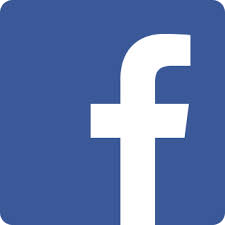 while on a smaller screen you will see the two boxes displayed on a loop. You can decide whether to let them looping or fix one of the two on the screen. 40.000 USACE (US Army Corps of Engineers) surveys integrated and updated every week, to show you the best route in complex areas. The USACE districts, distributed in the whole USA, are in charge of regularly survey the inland navigation channels system. 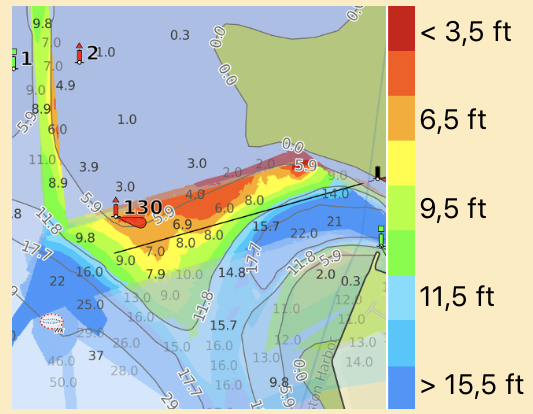 Especially in those areas where the bottom changes frequently due to the precipitations or due to a storm, USACE performs a depth survey and publish it as soon as possible to inform about the status of the navigation channel. This service objective is to inform as soon as possible the captain about the new survey data. The survey overlaid on the official map permits a better evaluation to properly plan the route in risky areas. 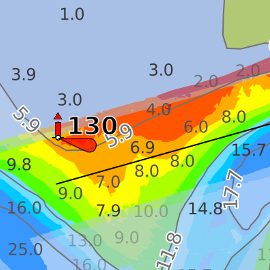 The USACE Survey data is composed by a set of depth areas displayed with highlight colors from dark red (very dangerous, usually below 3 feet) to blue (safe above 15 feet) and spot soundings. This data is integrating all the USACE Surveys from the late 1990 till today. 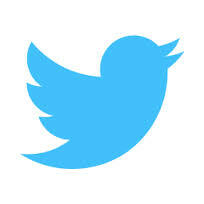 The integration is done to always have on top the latest survey available. For safety reasons the older surveys are faded on the screen while the newers are highlighted with brillant colors. Through the setting page you can also chose to display only the last 3 years or last 1 year surveys. NOTE: all the USACE districts are in charge to upload their surveys as soon as possible into the database we use for this service. However we experienced with some district there is a delay in the upload up to several weeks, while others upload their new surveys in few days. Be careful!